OHIO IN THE CIVIL WAR. GENERAL JOHN BEATTY was born near Sandusky, Ohio, December 16, 1828. His education was obtained at the district school of a pioneer settlement. His grandfather, John Beatty, was an anti-slavery man of the James G. Birney school from him the present John imbibed in boyhood his first political tenets, and to these he had adhered somewhat obstinately ever since. In 1852 he supported Joint P. Hale for the presidency. In 1856 he cast his vote for John C. Fremont. In 1860 he was the Republican presidential elector for the district which sent John Sherman to Congress. When the war broke out in 1861, he was the first to put his name to an enlistment roll in Morrow county. He was elected to the captaincy of his company, subsequently made lieutenant-colonel, then colonel of the Third Ohio Volunteer Infantry, and in 1862 advanced to the position of brigadier-general of volunteers, he was with McClellan and Rosecrans in West Virginia, summer and fall 1861; with General 0. M. Mitchel in his dash through Southern Kentucky, Middle Tennessee and Northern Alabama in the spring of 1862. Returning with General Buell to the Ohio river, he joined in the pursuit of Bragg, and on October 8, 1862, fought at the head of his regiment in the battle of Perryville, Kentucky. In the December following he was assigned to the command of a brigade of Rousseau’s division, and led it through the four days’ battle of Stone River, closing on the night of January 3, 1863, with an assault on the enemy’s barricade, on the left of the Murfreesboro’ turnpike, which he carried at the point of the bayonet. He was with Rosecrans on the Tullahoma campaign, and after the enemy evacuated their stronghold, overtook them at Elk river, drove their rear guard from the heights beyond, and led the column which pursued them to this summit of the Cumberland. While the army rested at Winchester, Tennessee, he was president of a board to examine applicants for commissions in colored regiments, and continued in this service until the army crossed the Tennessee river and entered on the Chattanooga campaign. In this advance into Georgia his brigade had the honor of being the first of Thomas’ corps to cross Lookout mountain. He was with Brannan and Negley and in the affair at Dug Gap, and took part in the two days’ fighting at Chickamauga, September, 1863, and in the affair at Rossville. At the re-organization of the Army of the Cumberland he was assigned to the command of the second brigade of Davis’ division Thomas’ corps, but was with Sherman at the battle of Mission Ridge; and when the rebel line broke he led the column in pursuit of the retreating enemy, overtook his rear guard near Graysville, where a short but sharp encounter occurred, in which Gen. George Many, commanding the opposing force, was wounded, and his troops compelled to retire in disorder. Subsequently he accompanied Sherman in the expedition to Knoxville for this relief of Burnside, and the close of this campaign ended his military service. Gen. Beatty was elected to the Fortieth Congress from the Eighth Ohio district, and reelected to that. Forty-first and Forty-second Congresses, serving first as member of the Committee on Invalid Pensions, then as Chairman of the Committee on Public Buildings and Grounds, and finally as Chairman of Committee on Public Printing. In 1884 he was one of the Republican electors-at-large, and in 1886-7 a member of the Board of State Charities. He has since 1873 been engaged in the business of banking at Columbus, Ohio. ments credited to other States, thousands entered the gun-boat service, of whom Ohio has no record, while other thousands enlisted in the regular army. “From the best prepared statistics of the Provost Marshall General and Adjutant-General of the U. S. A. and the Adjutant-General of Ohio, excluding reenlistments, ‘squirrel-hunters’ and militia, and including a low estimate for regular enlistments in the army and navy not credited to Ohio, it is found that Ohio furnished of her citizens 340,000 men of all arms of the service for war; reduced to a department standard, they represent 240,000 three-year soldiers. To these should be added twenty-six independent batteries of artillery, and five independent companies of cavalry. 6,536 Ohio soldiers were killed outright in battle. 4,674 were mortally wounded and subsequently died in hospital. 13,354 died of disease contracted in the service. In the two hundred and thirty-one regiments, twenty-six independent batteries of artillery, and five independent companies of cavalry which entered the field from Ohio, there were but 8,750 drafted men; all other members of the organizations referred to being volunteers. It should be observed, however, that the patriotic impulses of many who volunteered during the later years of the war were to some extent stimulated by the offer and payment of liberal bounties. This fact, without being permitted to detract at all from the credit of the soldier who accepted the money, should be remembered to the honor of the loyal citizen who paid it cheerfully and promptly. No army ever had a more abundant and sympathetic support than that accorded by the loyal men and women of the North, who carried forward with intense energy the ordinary business of civil life, while sons, brothers and tins- bands were in the field. Indeed, when we consider that more than one-half of the adult male population of Ohio was in the army, and that probably one-half of those who remained at home were unfitted by age or physical infirmity for military service, and that very many others were held to their farms and offices by business obligations, which could not be honorably disregarded, or family ties it would have been cruelty to sunder, we shall be at some loss to determine whether those who by their industry and liberality made it possible for an army to live, are entitled to less or more credit from the country than those who fought its battles and won its victories. To the young there is nothing more attractive than war and nothing more precious than martial honors. It must occur, therefore, that the brother who remains at home to provide for the wants of the household, and attend to interests which cannot be wholly abandoned, often makes a greater sacrifice of inclination and exhibits a more unselfish devotion to duty than the one who dons a uniform, and with music, banners and loud hurrahs marches to the front. the country, or to make special reference to those even who were killed in battle and interred in hurriedly-made graves on the fields where they fought. There are none so obtuse, however, as not to know that in patriotism and courage, and frequently in education, wealth and natural capacity, the private soldier of the Union army was the full equal of those under whom he served, and to whose orders he gave prompt and unquestioning obedience. In war, as in politics, all cannot be leaders, and often in both spheres the selfish and incompetent push clamorously to the front, while men of Superior merit stand modestly back, content to accept any place in a good work to which accident may assign them. Note: Tables designed by transcriber for ease of reading. General Eli Long, for a time Colonel 4th Ohio Cavalry; General S. S. Carroll, for a time Colonel 8th Ohio Infantry; and General Charles Harker, first Colonel of the 65th Ohio Infantry, are not included in the above list, for the reason that they were officers of the regular army, and neither by birth nor residence Ohio men. It would hardly be safe to a reader in search of truth to assume that rank at all times, or even generally, indicated the relative merit of officers in the volunteer service. Brevet rank conferred neither additional pay nor authority, and near the close of the war the government was prodigal of gifts which cost it nothing, and of such gifts gave freely to all for whom they were asked. On the other hand it would be a mistake to conclude that some of those brevetted were not justly entitled to greater honors and compensation than many whose rank was higher and commands larger. It is but natural for governors to provide well for those nearest to them officially and otherwise, for senators and representatives to be partial to their own kinsfolk and following, and for victorious generals to think first of their intimate personal friends. Still the honors were probably as fairly awarded as those in civil life. Accident, opportunity, family and social influence, when favorable, are important helps in war, as well as in and business. It will be observed that the graduates of West Point kept well to the front during the war. They were educated for this purpose, and the government exercised its authority wisely when it sustained them even under circumstances which would have been deemed sufficient to retire a volunteer officer in disgrace. It may be truthfully said, also, that the officers of the regular army, with few exceptions, sustained each other loyally, and never permitted even a straggling honor to escape which could by hook or crook be gathered in for the glorification of their Alma Mater. The officers of Ohio birth whose names are given above, were, but few exceptions, born during the first thirty years of the present century, when Ohio was simply a vast wilderness with here and there a clearing and a. cabin. Many were farmers’ sons, who received the rudiments of an education in the log-school houses of pioneer settlements during the winter months, and in summer assisted their fathers in the rough work of converting heavily timbered lands into productive fields. The habits of frugality and industry then attained undoubtedly contributed much to their subsequent success. be credited to the place of their birth rather than to that of their residence. It is apparent, therefore, that the claim usually made by Ohio goes too far or not far enough, and that a wiser adjustment of the whole matter could be attained by pooling the honors of the war with other loyal States and simply boasting that those who won them were American citizens. No fair estimate of the magnitude of Ohio’s contribution to the war, however, can be obtained without taking into consideration the services of eight men in civil life who did more, probably, to insure the success of the Union cause than any eight of the Generals whom the State sent to the field. States, 1860, and Secretary of War from January, 1862, to August, 1867. Senator from Ohio, Governor of Ohio, and from March, 1861, to 1864, Secretary of the Treasury. Ohio, and member of the Finance Committee of the Senate. Benjamin F. Wade, born in Massachusetts, October 27, 1800, United States Senator from Ohio, and Chairman of the Senate Committee on the conduct of the war. William Dennison, born at Cincinnati, November 23, 1815, Governor of Ohio from January, 1860, to January, 1862. David Tod, born at Youngstown, February 21, 1805, Governor of Ohio from January, 1862, to January, 1864. John Brough, born at Marietta, September 17, 1811, Governor of Ohio from January, 1864, to the close of the war. 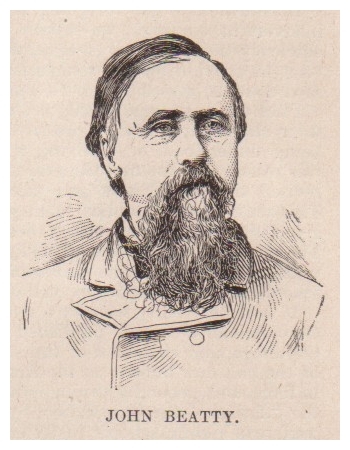 Jay Cooke, born at Sandusky, August 10, 1821, Special Agent United States Treasury Department for the negotiation of bonds. The population of Ohio probably represented more nearly than that of any other State, the people of all the older sections of the Union. Settlers from New England and New York predominated in the Western Reserve. Pennsylvania had peopled the eastern counties; Virginia and Kentucky the southern and southwestern; and so we find that Grant’s father and Rosecrans’s came from Pennsylvania; Sherman’s and Tod’s from Connecticut; McPherson’s and Garfield’s from New York; McDowell’s, Kentucky; Dennison’s, New Jersey; Gillmore’s, Massachusetts; Stanton’s, North Carolina; while Chase was born in New Hampshire, and Ammen, Brice, and Tibball were natives of Virginia. It was thus on Ohio soil that the people North and South first met and fraternized, and by their united and harmonious efforts transformed, within less than half a century, an unbroken wilderness into a rich and powerful State.